Cloudberry Unlimited comes with Image Based Backup feature. This feature can significantly enhance the abilities of Managed Backup providers and help them to provide compelling backup service to their customers. Image Based Backup feature allows you to take a snapshot of an entire operating system with all the data associated with it including the system state and all the application configurations and just save it as a single file called "image". With this feature you can recover operation system on your customers' computers right from the system image file as it was on the moment of the last run of the Image Based Backup. Currently, the Image Based Backup is the most reliable way to back up everything on a system. It is an efficient way to prevent possible consequences of system crash that is useful for servers and workstations. Step 1. Run the Backup client. Step 2. Click on the Image Based button. Step 3. Select a cloud storage to store your image-based backups. Step 4. Specify a name for your backup plan. Step 5. Select Image Based Backup option. Step 6. 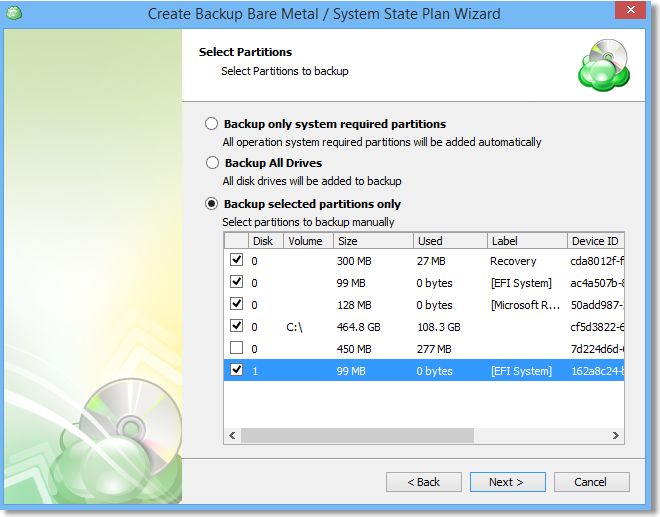 Select the partitions you want to back up and hit Next. Step 7. Select files/folders you want to exclude. Step 8. Specify encryption and compression options for your backup plan. Step 9. Specify Purge options. Step 10. Set up the backup schedule. Step 11. Specify pre/post actions. Step 12. Specify notification options. Step 13. 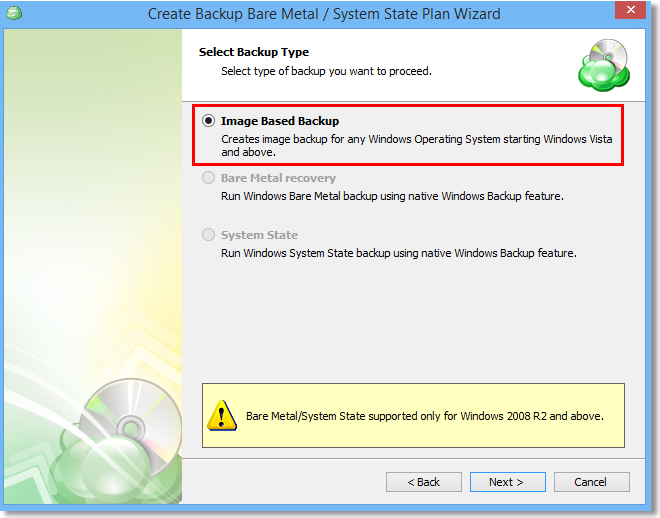 See the Summary screen and finish the Backup Wizard. Now your backup plan is ready! 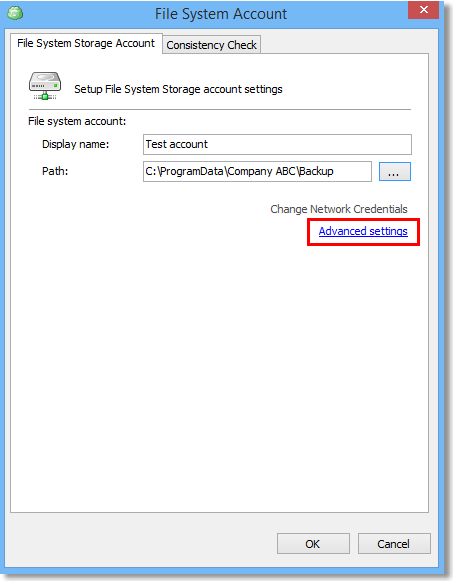 To run it immediately, just check the Run backup now box in the end of the backup plan setup. Step 2. Click on the Restore button. Step 3. Select a cloud storage to restore your system image file from. Step 4. Choose whether you want to run this restore plan just once or to save the plan so you can use it further. Step 5. Select Restore Image Based Backup option. Step 6. Select the restore type: whether you want to restore the latest version of the files or restore them to a particular point in time. Step 7. Choose, whether to restore your image based backup as a physical disk or as a virtual disk. 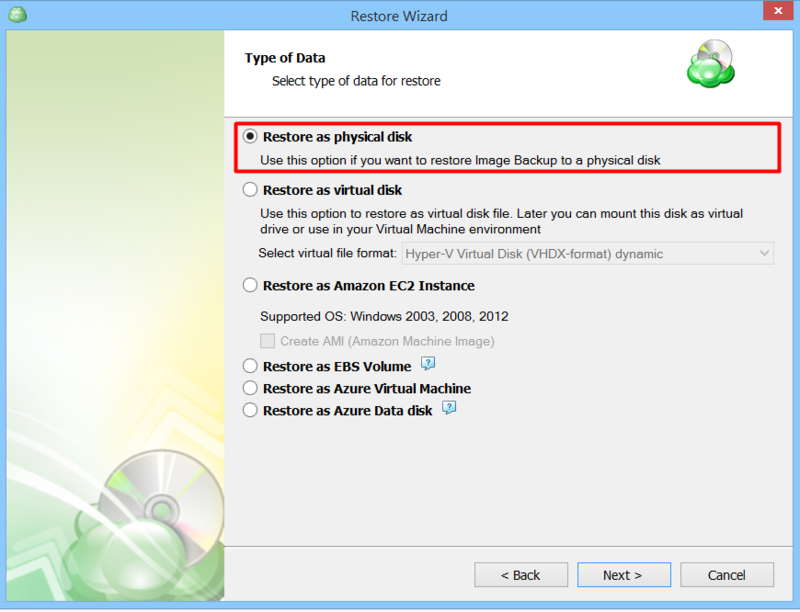 Note: In this article, we select "Restore as physical disc" option to perform the physical to physical restore (P2P Restore). 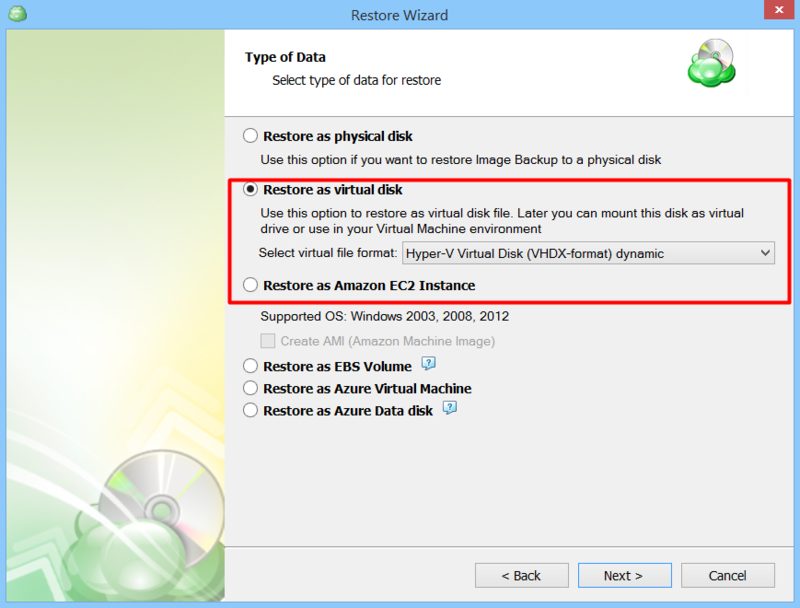 If you want to perform the physical to virtual restore (P2V Restore), please refer to the following article: How to Perform Physical to Virtual Restore with Managed Backup. Step 8. 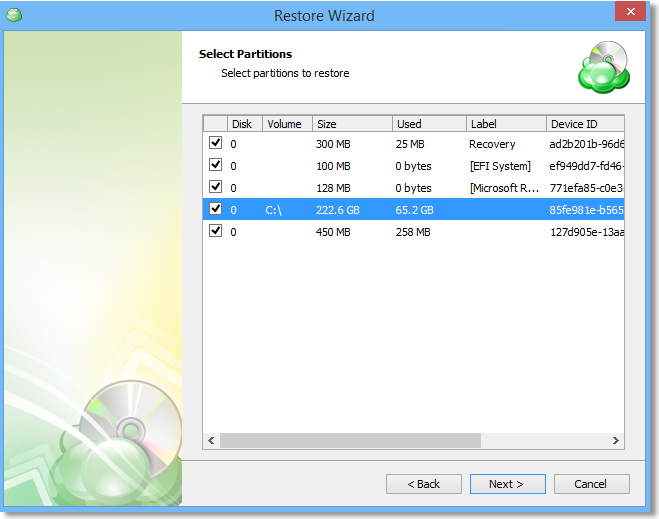 Select the partitions you want to restore. Step 9. 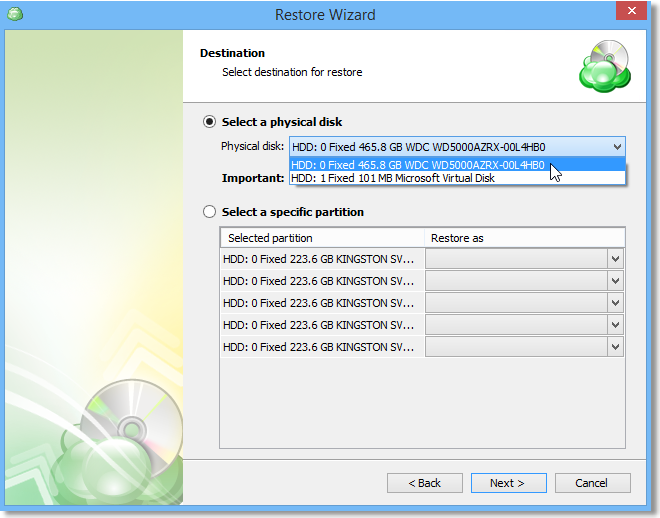 Select the destination for restore: the particular physical disk you would like to restore your image based backup to. Step 10. On the Decryption screen, enter the password you've specified in the Backup Wizard (Step 7). Step 11. Specify notification options. Step 12. See the Summary screen and finish the Restore Wizard. 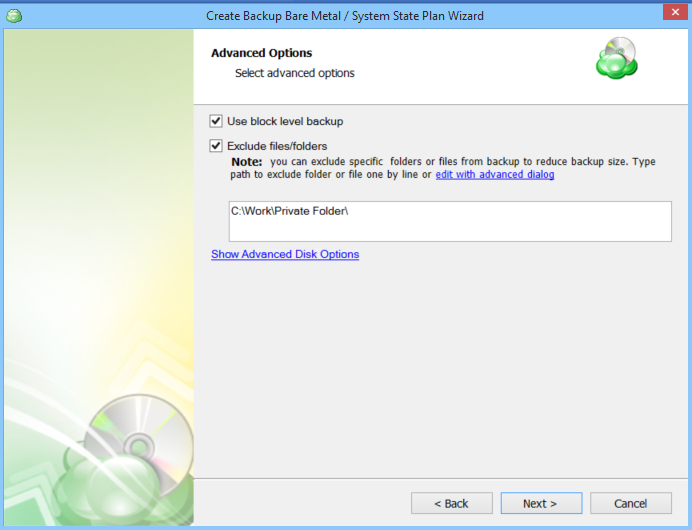 To run a restore plan immediately on the end of the backup plan setup, check Run backup now box. 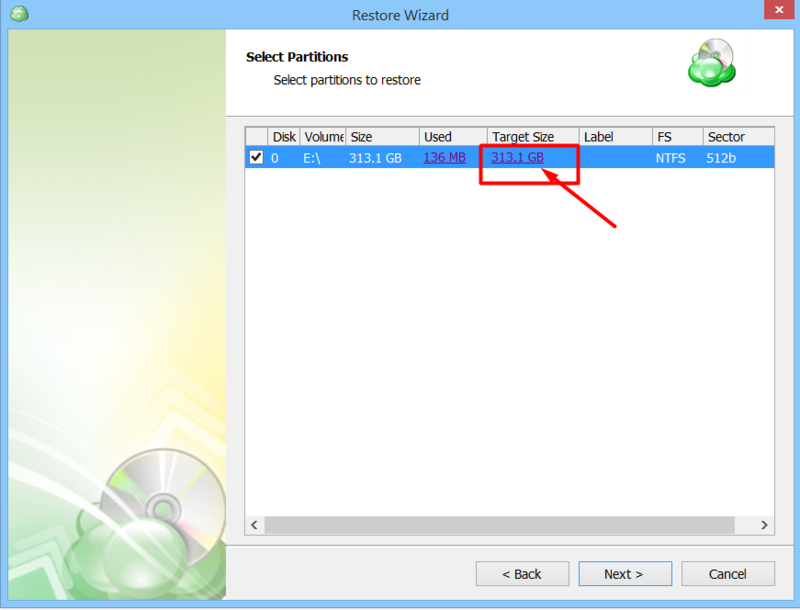 You can also resize selected partitions and restore to several virtual disks. On the Step 7 of the restore guide select Restore as a virtual disk. 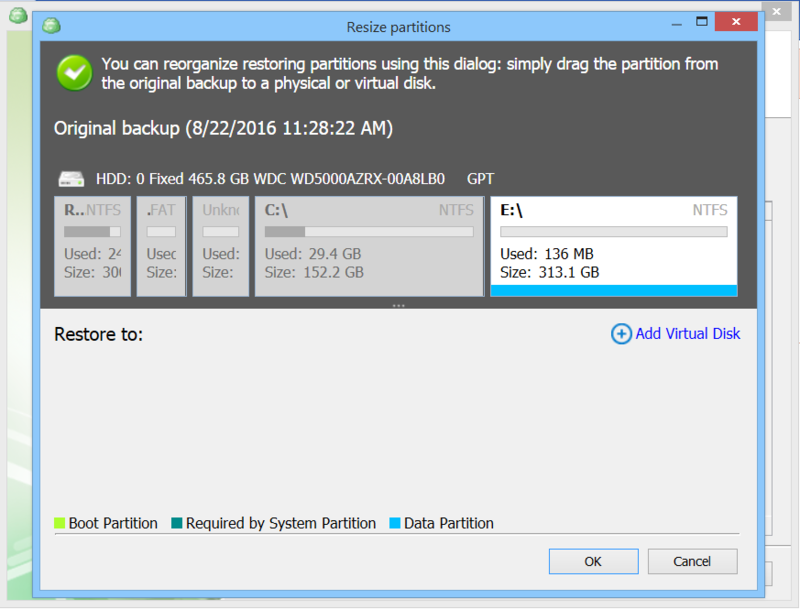 Select Reorganize partitions using advanced dialog. The window will open allowing you to configure virtual partitions. Select Restore as a physical disk. Click on the target size amount of the needed disk. The window will open allowing you to specify custom partition size. Step 1. Download and install another copy of Managed Backup client on a new computer. Step 2. Register exactly the same cloud storage account that used before. Step 3. Select the same storage bucket as before. Step 4. Click on the Advanced settings link to specify the backup prefix. Step 5. 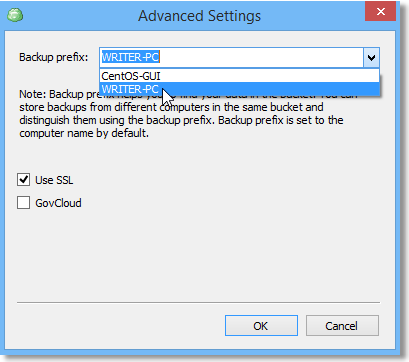 From the "Backup prefix" drop-down menu, select the same prefix that you used in you previous computer so that Managed Backup client can find the data in the specified storage bucket. Step 6. The next step is to synchronize the repository in order to retrieve the metadata of all the files associated with the backed up system. To synchronize the repository, select Options from the drop-down menu located in the top-right corner of the screen. Step 7. 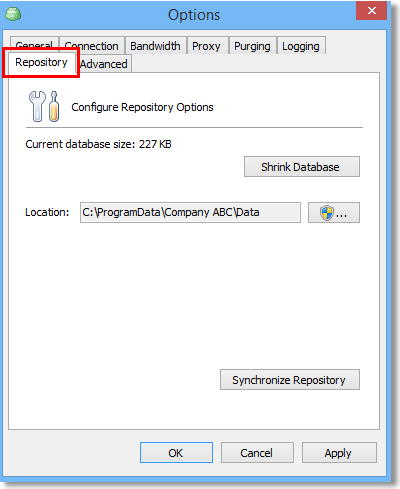 In the Options dialog, navigate on Repository tab and click Synchronize Repository button. Step 8. 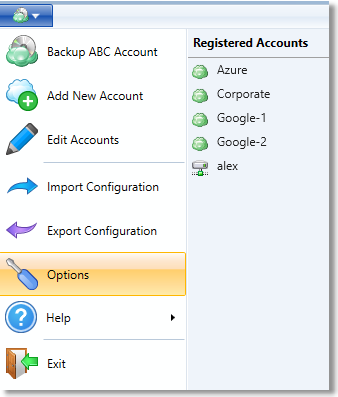 In the Synchronize Repository dialog, select the desired storage account from the Account drop-down list and click Synchronize Now button. 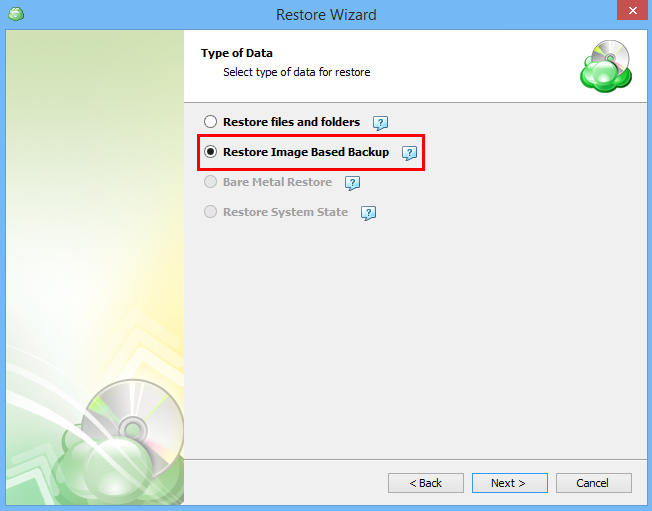 After all the steps required for repository synchronization are done, just go ahead and run the Managed Backup Restore Wizard to recover your system from an image based backup.